Visit my ART BLOG to see the latest things I'm up to! h Canada and the US, as well as numerous commissions for clients all over the world. I started out painting primarily in acrylics on wood, on a wide variety of items from jewellery boxes to salt and pepper shakers, clocks, leash holders and pencil cups, and have branched out to paint on just about any surface such as glass, slate, and the more traditional 'fine art' surfaces of paper, board, canvas, etc. Though acrylic remains my primary medium regardless of the surface, I also regularly work in various other mediums such as oil, watercolour, ink, gouache, and pencil. Commissions are welcomed and make up a significant part of my business. 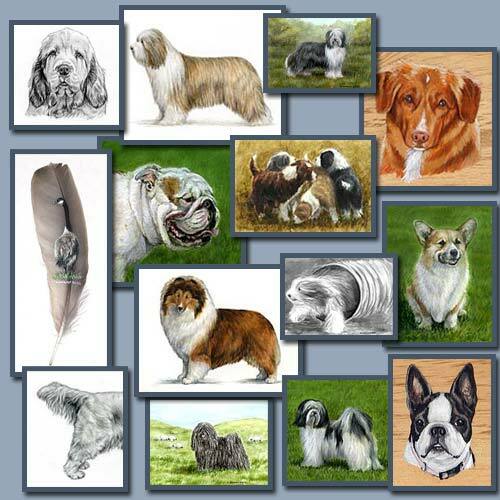 As a breeder and exhibitor of Bearded Collies for more than 2 decades, the knowledge I’ve gained about structure and breed type has proved invaluable in my work, enabling me to truly capture the finer points of each breed. That my work has met with widespread approval from top breeders and judges throughout the world is very satisfying. 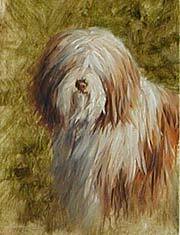 Being a ‘dog person’ myself, most of my work does involve dogs, however I have painted many other animals and subjects as well, and inquiries about any subject are welcome. 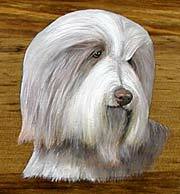 In most cases these trophies were individually painted pieces, however for the 2003 Bearded Collie Club of America National I was commissioned to do 4 paintings which were then reproduced on boxes, notecards, and shirts. These can be seen on the commissions page. In addition, other work I've done for breed clubs include logos for several specialties, some of which can be seen on the logo design page, and a number of illustrations for the Clumber Spaniel Club of America's Illustrated Standard, some of which can also be seen on the commissions page. Computer based work such as collages combining several photographs, producing either web graphics or archival prints for display have also increasingly become part of my business (the image below showing many photos of my artwork is one example of a web graphic collage.) Information on this can be found on the photo collages page.